So, I came home from work the other day and there was nothing cooked in the fridge. Although I could’ve simply whipped up a quick pasta dish, I thought I’d see what I have left unused for awhile. 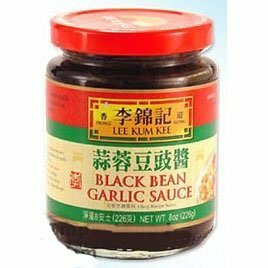 I found a dozen shrimp, 4 eggs, an open bag of frozen peas, leftover mushrooms and an almost empty bottle of black bean garlic sauce. Oh yeah, I also had this thing of fried garlic that’s been sitting in the pantry for awhile begging me to use it already. 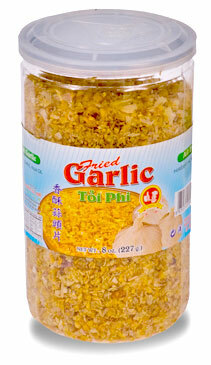 I got it from the local Asian store and it’s got the crunchy goodness you’ll love, I promise. Anyway, no voodoo here, folks! Very simple. Throw everything together, mix, cook and eat. And feel free to substitute your own leftover meat and/or veggies. That’s the whole idea. 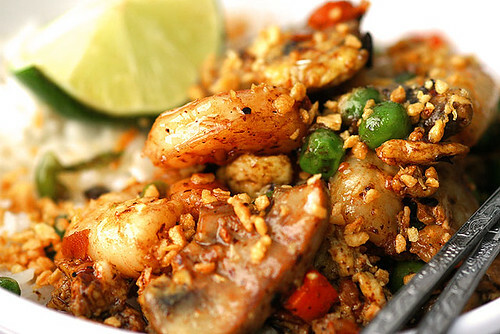 In a large bowl, whisk the eggs then mix in the shrimp, peas & carrots and mushrooms. In a medium-heated large skillet, add the canola oil and stir in the egg mixture. Use a spatula to scramble the eggs for about 4-5 minutes or until the eggs and shrimp are fully cooked. Do not overcook! Halfway through, stir in the black bean garlic sauce until evenly incorporated. Turn off heat and drizzle in the sesame oil. Seve on a bowl of hot jasmine rice, give it a good squeeze of lime juice and garnish with fried garlic and a lime wedge. You’ve been good all week with a steady diet of granola and berries and rice milk. Well, it’s time for your reward. In my case, it’s a hefty meal I’ve been wanting to cook for a long time now. But this time, I wanted to do it my way and go with what’s available in the pantry. I don’t know about you but I get hungry quickly, so I wanted something simple and quick. My version of Huevos Rancheros definitely delivers, in no time. It took me 10 minutes to whip it up! I only had to grab a bag of tortillas from the store and I was all set. And since this dish is rich, I tried to make sure that I was using health-conscious ingredients without sacrificing one bit of flavor. Obviously, if you have homemade chilli sitting around, use it instead. I was just trying to come up with something quick and easy. In a large skillet, combine chili, salsa and cilantro. Bring to medium heat until bubbly. Drop the eggs on the mixture and sprinkle with shredded cheese. Cover and allow eggs to poach, about 4-5 minutes. Meanwhile, warm tortillas in the microwave for a few seconds. 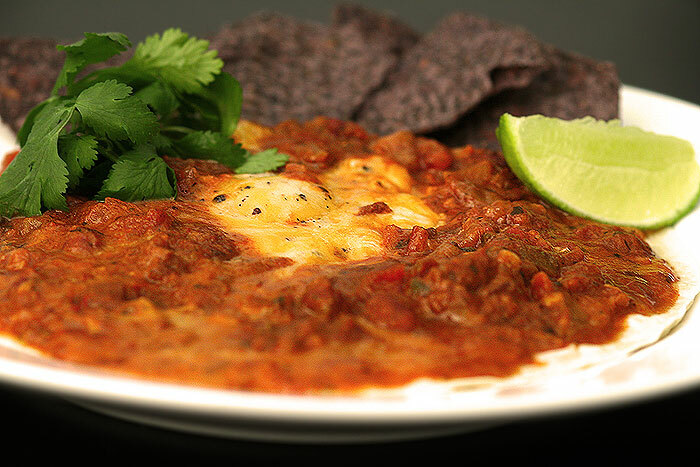 Lay on each plate two tortillas, then top with one egg and smother with chili mixture. Add a dash of hot sauce and a squirt of lime juice. Garnish with a lime wedge and more cilantro leaves. Serve with tortilla chips on the side. About a year ago, I started looking into eggs other than the dollar-a-dozen variety. I wondered if they were worth the price. Or, more importantly, worth switching over to. I love eggs but since I’m trying to cut down on cholesterol intake, I wanted not only to lessen my egg consumption but to choose a better kind to consume, as well. For awhile, I was using Egg Beaters and loved them. Eventually though, I started missing eggs – which tells me that with Egg Beaters, I didn’t feel like I was eating real eggs. Then I was curious about the cage-free and organic ones, so I did try all of them. Not really sure about the cage-free but the organic eggs (aren’t these cage-free, as well, anyway?) tastes like eggs I’ve had back when I was a small kid. I mean, those were what I call eggs, dangit! I didn’t realize how bad the regular eggs were until I started having organic ones. I noticed that when I try to crack them open, I had to use more force as the shells were pretty thick. And when you see the whole thing come out of the shell, it’s massive and thick. The regular ones were like diluted goo of a mess, in comparison. And the yolks! They’re almost red, not yellow. I mean, these has got to be the real deal! You can tell they weren’t fake, chemical-laden mutants or something. But at the end of the day, it all comes down to taste and satisfaction, doesn’t it? And with these babies, trust me, you get freshness that is simply undeniable. I don’t know about you but I am a convert. For almost a year now, I’ve only had organic brown eggs and nothing else. And I usually proportion twice as much whites as the yolks, if not more. That’s a healthy deal for me. Now, if they’d only come down in price, it would definitely be… egg-cellent!